Switzerland's Xherdan Shaqiri is looking to reignite his cvareer after disappointing spells with Bayern Munich and Inter. It’s ended goalless at the Maracana. France have topped Group E and Ecuador are heading home. The South Americans needed to match Switzerland’s score against Honduras, but the Swiss have won their match comfortably. Ecuador faced an uphill battle after captain Antonio Valencia was sent off early in the second half for a studs-up tackle on Lucas Digne. France peppered the Ecuador goal with shots but could not find a way past Ecuador keeper Alexander Dominguez. Xherdan Shaqiri scores again after great work from Josip Drmic. The ball is played out wide and Drmic cuts inside his marker before laying the ball into the path of Shaqiri, who strokes the ball home for his and Switzerland’s third. Honduras think they should have been awarded a penalty. The ball is lofted into the path of Jerry Palacios and as the forward bears down on goal, he is bundled over by a clumsy challenge from Johan Djourou. The referee ignores Honduran protests and waves play on. The French are turning the screw. A lovely pass from Benzema set up Sissoko, but he shot just wide. Jefferson Montero, one of Ecuador’s liveliest players, is off, replaced by Alex Ibarra. This is better from Honduras and they come agonisingly close to reducing the arrears. Jerry Bengtson rounds the keeper and slides the ball towards the goal, but Ricardo Rodriguez does brilliantly to scramble back and clear off the line. Ecuador’s captain is off after flying into Lucas Digne, studs up, feet off the ground. No debate about the red card. Mamadou Sakho on Oswaldo Minda. Goalless at the break, a result that would suit France, but Ecuador need to score with Switzerland in a comfortable position, 2-0 against Honduras. The South Americans have had chances on the break, with Enner Valencia leaping high for a header that was pushed out by Hugo Lloris. For France, Lucas Digne and Antoine Griezmann have linked well on the left flank. Digne was fouled for the free-kick that produced France’s best chance of the half, a header which Paul Pogba saw tipped over. Mamadou Sakho was lucky to get away with an elbow on Oswaldo Minda. Two goals from Xherdan Shaqiri have put Switzerland in complete control of this match. Honduras have enjoyed the bulk of possession but looked toothless up front. As things stand the Swiss are cruising into the last 16. Xherdan Shaqiri scores his second to double Switzerland’s lead. Collecting a pass from Josip Drmic, he bursts through the middle before steering a low shot past Noel Valladares. Switzerland are off to a flier courtesy of a stunning strike by Xherdan Shaqiri. The Bayern Munich midfielder cuts inside on to his left foot and hits a screamer into the top corner. Group E is one of the less straightforward groups, with all four countries still in with a chance of reaching the knockout stages. France need a draw to guarantee their last-16 place and qualify as group winners. Their opponents tonight, Ecuador, must match or better a Switzerland win or draw (barring a two-goal swing). Switzerland will go through if they better Ecuador’s result, while Honduras must beat Switzerland and hope Ecuador lose, in addition to a four-goal swing, to advance. Switzerland manager Ottmar Hitzfeld has made two changes to the side that was thrashed against France on Friday. Central defender Stefan von Bergen is injured and will be replaced by Fabian Schar, while up front, Josip Drmic comes in for Haris Serefovic. Honduras boss Luis Fernando Suarez also makes two changes with Wilson Palacios returning after suspension and Juan Garcia also in. Honduras: Valladares (c), Figueroa, Bernardez, J Garcia, W Palacios, Bengtson, Costly, B Garcia, Espinoza, Claros, Beckeles. France coach Didier Deschamps has made a number of changes for the final group games against Ecuador. Bacary Sagna, Lucas Digne, Laurent Koscielny, Morgan Schneiderlin, Paul Pogba and Antoine Griezmann all start. Ecuador have brought back captain Michael Arroyo, who closed his Twitter account after fans criticised his performance in the opening game against Switzerland. Striker Felipe Caicedo is dropped to the bench. A comfortable win for Bosnia over an Iran side that never looked like it really believed it could get anything out of this game. Victory here would have sent Carlos Queiroz side through to the last 16 for the first time n their history, but from the outset the weight of history appeared to weigh heavily. Bosnia will be rueing the late goal that was controversially ruled out for offside in their previous game against Nigeria. Had that stood, they would now be in the knockout stages. Argentina have beaten Nigeria 3-2 in Porto Alegre but both teams still go through to the knockout stage because Iran have lost to Bosnia-Herzegovina. A far more impressive performance from Argentina than in their first two group games, although Nigeria had their chances and Ahmed Musa scored two wonderful goals. 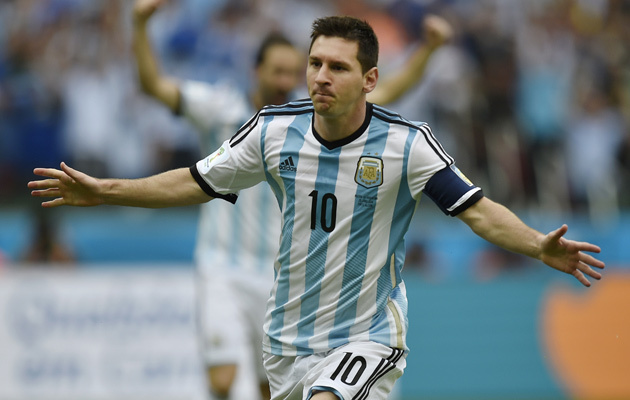 But Lionel Messi once again demonstrated his brilliance, and Argentina roll on to the last 16. How many times have we seen that at this World Cup. Bosnia core within a minute of conceding. Iran push forward in search of an equaliser but are hit on the counter-attack. The ball reaches full-back Avdija Vrsajevic whose left-foot shot goes in off the far post. Iran open their account at Brazil 2014 when the unmarked Reza Ghoochannejhad steers home at the far post after Bosnia had failed to deal with a free-kick. Iran give the ball away just outside their own penalty area and Dzeko slips a pass through to Miralem Pjanic who strokes the ball past Alireza Haghighi. Bosnia 2-0 up and Iran’s chances of progressing look dead and buried. Argentina are back in front! A corner lands at the feet of Marcos Rojo at the far post and the defender turns the ball over the line. Nigeria have done it again, another brilliant strike from Ahmed Musa, cutting in from the left and firing home. What a game! An explosive start to the match, with Lionel Messi scoring his third goal in as many games after just three minutes. Messi slammed home the rebound after Angel Di Maria’s shot had hit a post but Nigeria equalises a minute later with a brilliant run and shot from Ahmed Musa. But a brilliant Messi free-kick on the stroke of half-time has restored Argentina’s lead. Argentina are starting to get their act together, helped by some poor Nigerian defending. Sergio Aguero limped off after 37 minutes, giving Ezequiel Lavezzi a chance to impress. But with Messi in such imperious form, Argentina do not need him. Messi again! A beautiful free-kick curled over the wall. Even Messi looks surprised by the brilliance of it. Since going ahead Bosnia have looked comfortable in Salvador. Iran almost equalised when they hit the bar moments after Dzeko’s opener, but other than that effort, they have struggled to make any inroads. Sergio Aguero has been subbed on 37 minutes. Lavezzi on. Aguero’s not had a great tournament so far and it looks like Lavezzi now has a big chance to impress. Iran’s hopes of reaching the knockout stages for the first time take a huge blow as they go 1-0 down to Bosnia. Edin Dzeko scores with a long range left-footed shot which goes in off the base of the post. Nigeria are back on level terms within 60 seconds. Left winger Ahmed Musa cuts inside on to his right foot and curls a stunning shot into the far corner. Incredible start to the game in Porto Alegre. Well that didn’t take long. Angel Di Maria is put through down the left and his shot strikes the post but rebounds into the path of Lionel Messi who smashes it into the roof of the net. We’re about to get underway in Poro Alegre, where the presence of tens of thousands of Argentina fans have made this practically a home match for the Group F leaders. Anything less that win for Nigeria and Lione Messi’s side will top the group. In the other match in Group F, Iran can still reach the last 16 if they defeat Bosnia-Herzegovina and Nigeria lose to Argentina. Bosnia make five changes to the side that lost 1-0 to Nigeria. Striker Vedad Ibisevic starts up front with Edin Dzeko. Iran name the same side that pushed Argentina all the way on Saturday before losing to an injury-time strike from Lionel Messi. Bosnia: Begovic, Vrsajevic, Spahic (c), Kolasinac, Besic, Pjanic, Ibisevic, Dzeko, Susic, Sunjic, Hadzic. Iran: Haghighi, Haji Safi, Hosseini, Sadeghi, Nekounam (c), Shojaei, Timotian, Montarezi, Ghoochannejad, Dejagah, Pooladi. This must be a first at Brazil 2014: both teams are unchanged from their previous matches. Nigeria: Enyeama, Ambrose, Yobo, Omeruo, Oshaniwa, Onazi, Mikel, Babatunde, Odemwingie, Emenike, Musa. Argentina: Romero, Zabaleta, Federico Fernandez, Garay, Rojo, Gago, Mascherano, Di Maria, Messi, Higuain, Aguero. Uruguayan fans have been speaking to the media about the latest Luis Suarez bite controversy. To some, he is a national hero who can do no wrong, while others provide a more balanced assessment o Brazil 2014’s pantomime villain. Authorities in the southern Brazilian city of Porto Alegre are preparing for the arrival of 80,000 Argentine fans for Wednesday’s match against Nigeria. FIFA medical bosses are keeping an open mind on amendments to the laws of football and match regulations to cope with the increasingly contentious issue of concussion. The clarification comes in the wake of defender Alvaro Fereira being knocked out in Uruguay’s game against England, but then overruling medical staff and insisting on returning to the field of play. Did Luis Suarez and Giorgio Chiellini have previous? An intriguing image from last year’s Confederations Cup meeting between Uruguay and Italy, appears to show Luis Suarez about to sink his teeth into Giorgio Chiellini. Was this a dry run for yesterday’s bizarre incident? After yet another extraordinary day at Brazil 2014, a tournament which is shaping up to be one of the all-time classics of international football, we’re back in action today with four final group matches. Group E reaches its conclusion with Honduras facing Switzerland and France meeting Ecuador, while in Group F Nigeria play Argentina and Bosnia-Herzogovina take on Iran. Inevitably, in the wake of yesterday’s shocking footage in which Uruguay striker Luis Suarez appeared to bite Italy defender Giorgio Chiellini, FIFA has launched a disciplinary investigation. Suarez has defended himself in an interview with Uruguayan television. “These are just things that happen out on the pitch,” he said. “It was just the two of us inside the area and he bumped into me with his shoulder. We’ll follow this astonishing story over the course of the day.